Spring has (almost) sprung, which means it’s time to bust out the raincoat, rain boots, cute umbrella and floral print everything! After a long winter of solid black, gray and burgundy, we’re super excited to re-introduce all sorts of vibrant colors, prints and patterns into the rotation. It’s also a great time to recalibrate our day-to-day wardrobe to suit the weather—we’ve got to pay for those May flowers somehow, right? 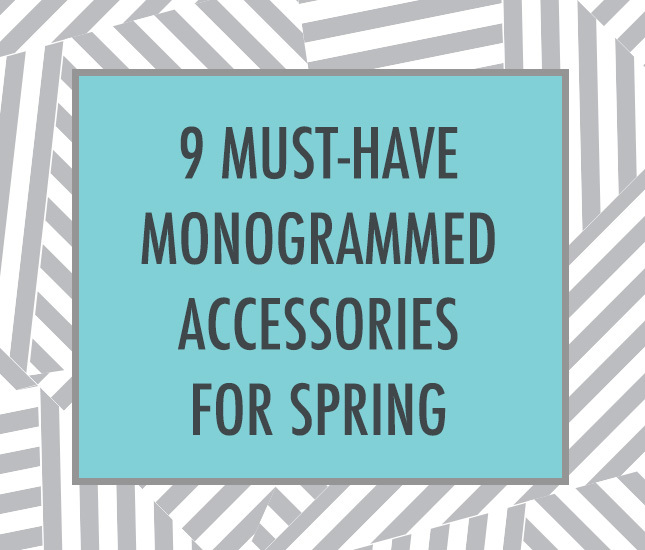 A Monogrammed Sunglass Retainer Strap—First things first: Get your best pair of sunglasses spiffed up and ready for their springtime debut, and make any pair feel especially springy with one of these cute monogrammed sunglass straps. The best part is, they’ll help your shades stay in place during all your spring adventures, whether you’re hunting Easter eggs or going on your first bike ride of the year. A Flowery, Monogrammed Drink Cooler—It’s finally time to indulge in a fruity cocktail and sip a cold one on the porch. And since we’ve had especially warm springs lately, you don’t want to risk prematurely warming your beverage. Luckily, we’ve got you covered with our super cute monogrammed drink insulators in your choice of fun pattern. A Monogrammed Umbrella—Every good spring participant should get caught in a rainstorm or two this season, so why not do it in style? Our monogrammed umbrellas are as cute as it gets, with patterns like all-over floral, black bows and gray mixed stripes. Grab one of each so that you always have one to match your ensemble. A Monogrammed Pineapple Phone Case—We don’t mean to jump the gun, but we suspect that pineapples are going to be everywhere this spring and summer. And why not? They’re sweet, colorful and the perfect way to will warm weather. Go ahead and get into the summery spirit a little early with one of these essential cases. A Monogrammed Rain Jacket—If you don’t already have one of these cute and practical staples, now’s the time of year to get one! We love them because they’re 100 percent wind and waterproof but they also don’t skimp on style. Available in an assortment of cute colors, this personalized rain jacket is a must for spring days on campus, running errands and puddle-jumping. A Monogrammed Baseball Hat—It’s not yet time for the big-brimmed sun hat, but you’ve still got to protect yourself from the sun when the weather begins to warm. Perfect for springtime jogs, hikes, bike rides and sporting events, a personalized ball cap keeps your face and eyes shaded from the sun all spring long. Grab yours in season-inspired styles, like gingham, seersucker, coral or mint. A Monogrammed Skinny Tumbler—It’s the time of year when we all start trading cappuccinos for Frappuccinos and lattes for lemonades. Swap out your monogrammed mug for something more seasonally appropriate, like a cute personalized tumbler in a fun, bright color. Fill it to the brim with a little springtime punch, sparkling water or sweet tea and you’re good to go. A Monogrammed Cooler—As the weather begins to warm, we’ll begin to find all sorts of excuses to play on the porch or patio. Fill up your personalized cooler with a few refreshing essentials to make open-air relaxation especially enjoyable. These coolers come in a variety of cute-as-can-be prints and patterns for the stylish sipper. A Monogrammed Seersucker Weekender—Whether a weeklong spring break vacay or a four-day getaway you snuck in for good measure, you don’t want to go without the proper travel accouterments this season. This oversized, monogrammed weekender is a top-notch pick for carting the essentials and more to wherever you wind up. You don't have to toss all your solid-colored stapes for head-to-toe funky florals this year. capture the essence of April and May! Happy accessorizing!